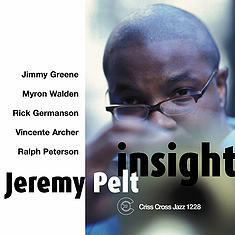 Trumpeter Jeremy Pelt, 25 years old, has garnered notice since landing in New York, four years ago, for his superb charts and professionalism. Insight, his Criss Cross debut, demonstrates that he's also a composer with a point of view. Helping him articulate it are a take-no-prisoners ensemble of New York first callers, all 30-and-under with the exception of veteran drum avatar Ralph Peterson. Jimmy Greene is on tenor sax, Myron Walden on alto sax, with pianist Rick Germanson and bassist Vincente Archer.